Everyone wants their garden to look bright and colourful ready for the summer months, and giving your shed a bit of TLC is a great place to start. Preparing your shed for summer doesn’t need to cost the earth. We’ve put together some of our favourite ways to spruce up your shed. 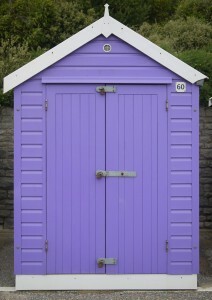 Wooden sheds are vulnerable to weathering, and therefore need treating periodically. Wood treatment can protect your shed against rot and helps to make it waterproof. To brighten up your timber shed and to add an extra layer of protection, why not paint it a colour that compliments your home and garden? If you feel like getting creative, you could even paint it with more than one colour. It’s important to ensure that any damage to the shed has been repaired before painting and that the wood has been properly treated. Most sheds are ridden with cobwebs, spiders, dust and gardening debris. Take some time to clear out your shed, taking care to either donate or throw away anything that is no longer of use to you. Once you’ve emptied out the contents, you can begin to wipe, dust and hoover the interior of your garden shed. Whilst you’re there, you can even add a lick of paint to the inside walls and a rug to protect the flooring. Taking the time to clean, and make your shed interior look nicer, can give it a whole new lease of life by making it look lighter, and feel bigger. Even after painting and cleaning the inside and outside of your shed, if you just go and throw all of your tools and equipment back in there, it’s not going to feel clean and tidy. Hanging your tools from heavy-duty hooks not only clears floor space but prevents them from falling over and getting damp on the floor. 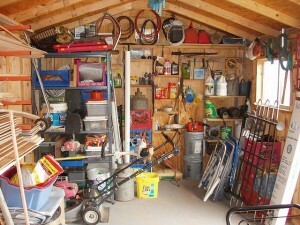 Hanging your tools up also makes it easy to find exactly what you’re looking for every time you enter your shed. If you have a lot of smaller items that you want to save from getting lost, you can also install a selection of wall-mounted baskets. Moving back outside, if you’d like to make your shed look more attractive you should consider adding some floral touches. Adding raised planters, hanging baskets and bird feeds to the exterior of your shed can work wonders. Plant or hang flowers that complement your brand new shed colour, and use bird feeders to ensure that there is always plenty of nature in your garden. Lastly, if you have a really old, drab looking shed, that needs more than just a clean and a paint, then why not invest in a new one? Sunningdale Timber are experts in providing sheds that cater for all of your timber needs. We can work with you to create a bespoke shed that is ideal for your garden size, stays within your budget and meets all of your requirements. Contact us today on 0116 2312876 for further information, or get in touch through our online contact form. This entry was posted in Latest News, Sheds. Bookmark the permalink.